Photo: You may need to read between the lines. 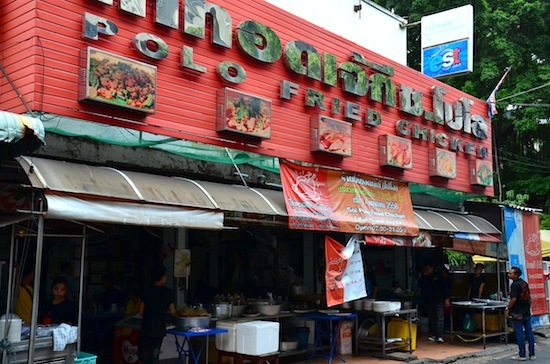 Named after the side street where it was first born as a humble street stall, Polo Fried Chicken has become one of Bangkok’s best-known eateries among both Thais and foreigners. Dozens of writers have waxed about its specialty gai tort (fried chicken) for small-time travel blogs and big-name media outlets, but does Polo deserve the hype? Flavours are big and bold, just like the sign. On a few different visits, our experience has been that, yes, Polo is doing something special. Whole plump chickens are fried the night before and drained to get rid of the excess oil that commonly drips from street-stall gai tort. We’ve found the white meat tender enough to easily eat Thai-style — with a fork for holding and spoon for cutting. It’s juicy and with a texture that’s never stringy. Wings and legs are the stuff that addictions are made of. Perfectly crispy skin is lightly salted, topped with a generous sprinkling of garlic which is fried to a dark brown, resulting in a richer flavour than most. A whole bird goes for 200 baht while a half comes in at 130 baht. Even when the restaurant is busy — as it usually is — the fried chicken is hacked up and served within a couple of minutes after ordering. 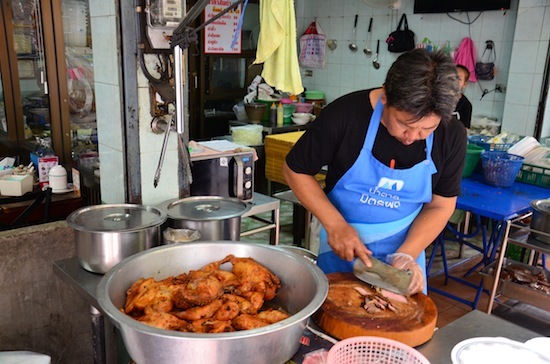 The snappy black-shirted staff also serve an extensive menu of Isaan favourites to compliment the superstar chicken. Som tam (papaya salad) is offered in a variety of different ways. You’ll also find laap — a salad of minced meat tossed with toasted rice, garlic, roasted chillies and more — available with duck, beef or pork. 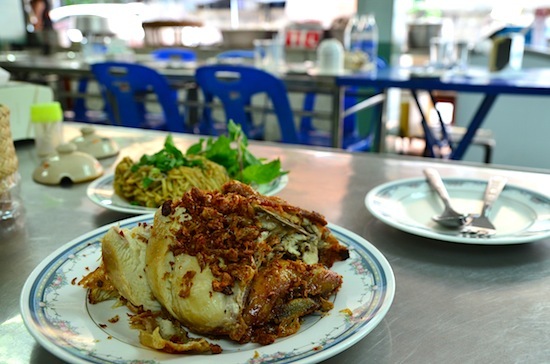 If you want to combine the Northeast Thai spices with the fried chicken on a single plate, go for the nam tok gai tort. We’re partial to the sup nawmai, a similarly aromatic salad made with strings of boiled bamboo shoot. 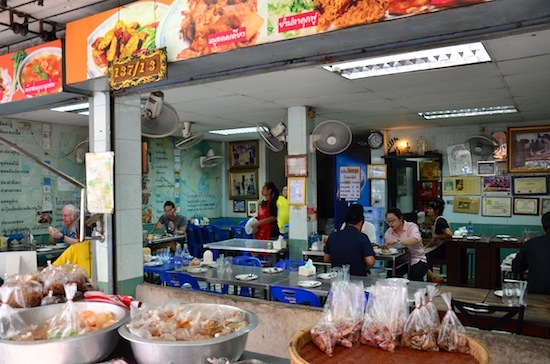 Other popular options include fiery Isaan soups like tom zaap, deep-fried fish cakes (tort man pla), grilled pork shoulder (kor muu yang) and whole deep-fried tubtim fish. As with any good Isaan meal, a basket of sticky rice is a must. As with most Bangkok street food, a sprinkling of MSG should be expected. Most dishes go for just 40 to 80 baht, making Polo a good option for a cheap meal that will leave you close to comatose. The menu comes with English descriptions and pictures, and a few of the staff members can speak some English. Avoid meal times, avoid the crowds. With fans, steel tables clustered close together and some framed photos of the owners’ family and Thai royalty hung on the back wall, the open-fronted establishment has stuck with a streetside ambiance. The kitchen is located off to the side and has an open front that allows diners to watch their food being prepared — a good sign from a cleanliness standpoint. The tables fill up during lunch and dinner rushes, when a queue of takeaway patrons forms out the front.